I love science fiction and I love games; but I hate waiting around. Unfortunately, whether it’s a music class, sports practice, or just school pickup, I do a lot of waiting. Why not play a game? Twin Stars is a solo wallet-sized game from Button Shy, played with only 3 cards at a time. With six scenarios and twelve characters, Twin Stars: Adventure Series I provides a system for solo gaming with 396 unique combinations (according to the Button Shy website). Jason Tagmire and Mike Mullins designed the Twin Stars system. 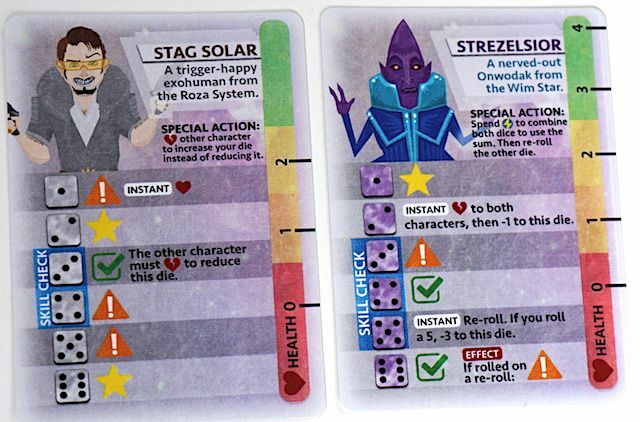 To begin, choose a scenario card and two character cards. The scenario cards are double-sided: one side sets the scene and specifies the difficulty level and number of tokens required to play. The other side is your play tracker: it gives a score track and specifies combos and win/lose conditions. The scenarios differ wildly from each other. 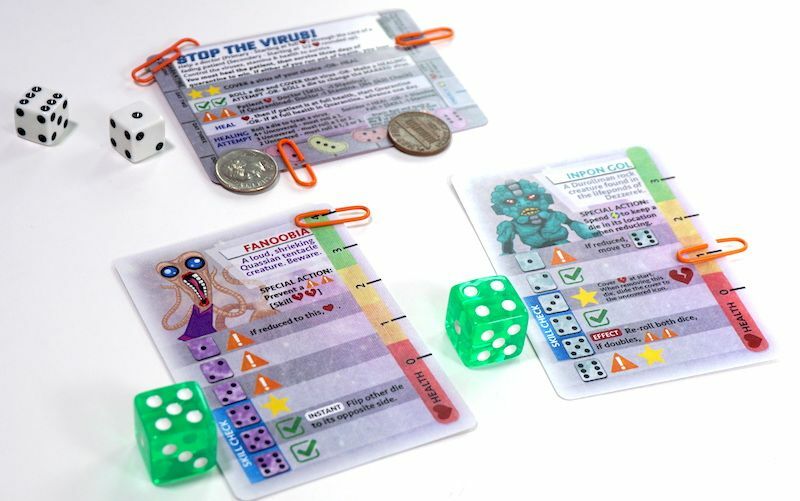 Your characters may be escaping a prison guard in “Escape the Brig”, firing weapons at enemy starships in “Rule the World”, or taking the roles of doctor and patient in “Stop the Virus!” There’s also an optional campaign mode that lets you stitch together several scenarios in order. Your two characters each have a starting health, die icons, and a special action. Roll the dice, and place each one on a character. Order matters! 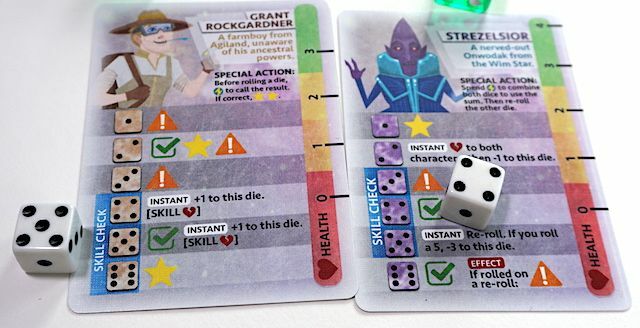 As you place the dice, they may trigger “instant” (optional) abilities or “effects” (required). Resolve these before continuing. When you place the second die, and after resolving any instants or effects, check for a combo. Combos are combinations of two icons, defined on the scenario card. If a combo has occurred, you take the action shown on the scenario card, then take both dice back into your hand to begin rolling again. If a combo does not occur, choose one die to take back into your hand, and reduce the other die by one (this does not trigger an instant). Then re-roll the die you had picked up and re-place it, applying instants, effects, and combos again. Some combos or penalties require a skill check. If the skill check fails, the character involved will take a negative effect. Each character has a skill check “range” indicated on their card. Roll a secondary set of dice, and see if each die can fit somewhere within each character’s skill check range. If both dice fit, the skill check succeeds. Otherwise, the skill check fails. Possible failure results include reducing health of a character, or skipping the next action. Each character has a special action they can use. Activate the action by paying the listed cost (usually “energy”). Any character can also spend one energy to re-roll one die. Keep re-rolling, applying effects and combos, and using special actions, until you reach either the scenario win condition or lose condition. Twin Stars: Adventure Series I is a huge amount of gameplay in a tiny package. Each game takes about 15 minutes, and the scenarios are significantly different from each other. The mechanic of rolling dice and then choosing one to reduce and one to re-roll makes for surprisingly difficult decisions when combined with the character abilities. Scenarios are challenging and depend on a good balance of strategy and luck. This is a quick solo game for “serious” gamers, and will likely be too frustrating for most kids, especially those under 10. Unfortunately, in trying to cram so much variety into just 18 cards, Button Shy ran out of room for detailed instructions. The scenario cards are crammed with small text, and still end up with some ambiguous instructions. This is mitigated by the FAQ on the Button Shy website, but having to look up online content decreases the value of Twin Stars as a highly portable game. The deluxe version includes 4 dice, lots of custom tokens, and a matching pouch to carry them all. Twin Stars is a little heavier than I’d prefer, but I’d recommend it for gamer parents looking for a compact solo game. It will surprise you with its depth. Until October 13, Button Shy is running a Kickstarter campaign for Twin Stars: Adventure Series II. It not only adds more characters and scenarios, but also new types of abilities. 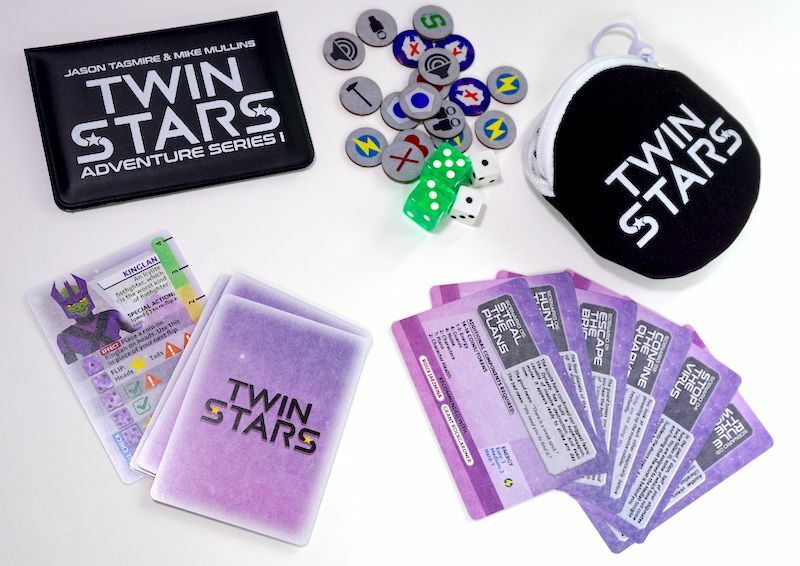 If Twin Stars sounds interesting, you can get both series for $19, or try a print-and-play version for just $3. The Family Gamers received a copy of Twin Stars: Adventure Series I deluxe edition from Button Shy for this review.